It is with deep sadness that we are informing you about the passing of Prateeti Ghosh. She passed away last night after a long battle with cancer. 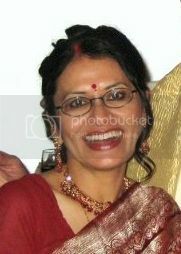 Prateeti was a wonderful person who was always full of positivity and helpfulness - the community will truly miss her. She is survived by her husband, Siddhartha and daughter, Tanaya. Our condolences go out to the Ghosh family and we request you all to keep them in your prayers. Please pray for her soul's peace. Memorial details will be sent once available.